As a parent and a math geek, I’m grateful that my four-year-old Philip is proficient in basic addition and subtraction. I owe a lot to developers of great math apps, such as Mathlandia, Quick Math, Moose Math, and Mystery Math Town. These apps have been instrumental in his development. One of the things that Philip is still struggling with is mentally calculating subtraction equations, especially the ones that involve a number between 11 and 18 that can be subtracted to a single digit. For example, 11 - 5 = 6 and 18 - 9 = 9. He needs to master this skill before he can work on stacked subtraction models that require him to borrow a digit to solve the equation. I believe that my app pick for today can help him practice this skill. Straightforwardly titled Math Word Problems for Kindergarten and First Grade, the app promises to help juniors solve math word problems. It uses a unique approach called Number Path and focuses on addition and subtraction models. The app has two levels: Level 1 includes problems that involve numbers up to 10, and Level 2 with numbers up to 20. I suggest starting with Level 1 first. For each level, the app will generate 10 word problems to solve one at a time. The screen is divided into several sections. The word problem is on the top section. There’s an audio button next to each problem, which can be tapped to have the problem read out to you. The next row of sections is divided into Sketch area and Ten Frame section. Juniors can use the sketch area to write anything that can help them understand the word problems, including how the equation would look like in a stacked model. Juniors can use the Ten Frame section to count the objects involved in the word problem. The app will show an appropriate icon in each of the boxes as juniors tap them. For example, if the word problem involves fish or balloons, the app will use fish icon or balloon icon appropriately. To add an object into the Ten Frame, simply tap on an empty box. To subtract an object from the Ten Frame, tap on an icon to cross it out instead. Each line in Ten Frame consists of five objects, which makes it easier for juniors to quickly count the objects by five. In Level 2, the Ten Frame will show four rows of five boxes -- a perfect placeholder for up to 20 objects. The next row is where the Number Path located. It’s essentially a row of boxes numbered from 1 to 10 (or 1 to 20 in Level 2). To add an object into the Number Path, simply tap on an uncolored box. To subtract an object from the Number Path, tap on a colored box, from the most-right box counting left, to cross it out instead. Number Path is an excellent way to show the result of the word problem without having to count the objects (as shown in the Ten Frame approach). The final row of sections is divided into Equation section and Answer section. You can write the equation that represents the word problem in the Equation section, and fill in the blanks in the Answer section with the rightmost colored box in the Number Path. All the sections are optional, except for the Answer section. 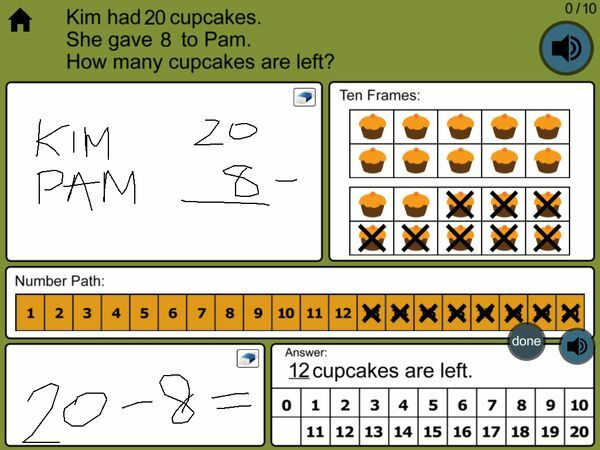 You don’t need to use them, but using them consistently in every word problems can help train your juniors solve the word problems on their own. Work on one sentence at a time. You can use the Sketch area to write the first number as the top operand in a stacked model. Then, tap on the empty boxes in the Ten Frame section and the uncolored boxes in the Number Path section to illustrate the first operand. Finally, use the Equation section to write out the first operand on the left hand side of the upcoming operator. Identify whether it’s an addition or subtraction model. Ignore the second operand for a moment. Once your juniors know what the proper operator is, write it down in the Equation section, next to the first operand. Then, work on the second operand. Write it as the bottom operand in the stacked model. Then, tap new boxes or cross out the existing ones in both the Ten Frame and Number Path sections accordingly. If it’s a subtraction model, I suggest working your way from the last box that is not crossed, and move forward. Finally, write the second operand next to the operator in the Equation section. Write out the rightmost colored box in the Number Path section as your answer in the Answer section. Verify that the Ten Frame section shows the exact number of objects which are not crossed. Read out loud the equation and the answer in a single sentence. For example, 11 - 5 = 6. Then, tap on the audio button next to the Answer section to have your answer read out. This app acts as a template for working your way towards a word problem. Only by working consistently with this template, and filling out everything that it suggests, will you get the most out of this app. Until the developers add a tutorial or any other visual cues to help guide parents and juniors on how to use the app, I suggest following these steps. There are two versions of this app available on the App Store. The free version only lets you play with the first level, whereas the Pro version gives you access to both levels. Number Path itself is a new approach developed Anne Gardner, a Response to Intervention Teacher in New York who has been working as a First Grade teacher for ten years, and was awarded National Board Certification in the field of Literacy. Number Path is an improvement on the Number Line approach that juniors typically see in their Grade 1-2 curriculums. Number Line is more error-prone with its zero-based approach. Oftentimes, juniors get confused whether to count from zero or one, and whether they should count the line markers or the spaces between them. Because there is currently no way to adjust the difficulty, or to exclude the subtraction problems for each level, I suggest introducing this app to your juniors if they’re already familiar with basics of addition and subtraction. Based on my experience with Philip, your juniors need to be comfortable with each model first before they can work with a combination of both. 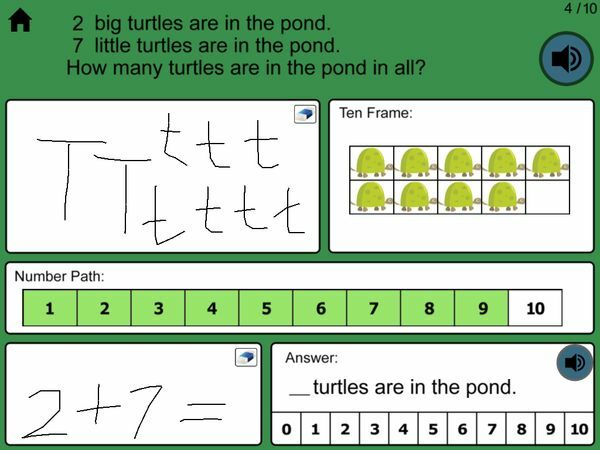 I really like the Number Path approach -- it’s a great tool for Philip to practice his mental subtraction skill, which will benefit him in working with the concept of borrowing in a stacked subtraction model. The app also includes four bonus games that juniors can play with after completing a set of 10 word problems. Each game is 60 seconds long, and they only appear after completing a level. They’re designed as a break from math practice. Therefore, they can’t be accessed from the main menu. Math Word Problems for Kindergarten and First Grade is a great math app for juniors to learn how to convert word problems into addition and subtraction equations accordingly. They can even see the answers to each question almost immediately by following the Ten Frame and Number Path steps correctly. Highly recommended for juniors ages 4-6 who are already comfortable with their basic addition/subtraction skills and are looking for a new challenge.